Located in Far North Queensland, there’s so much to experience both in the water and on land in Port Douglas. 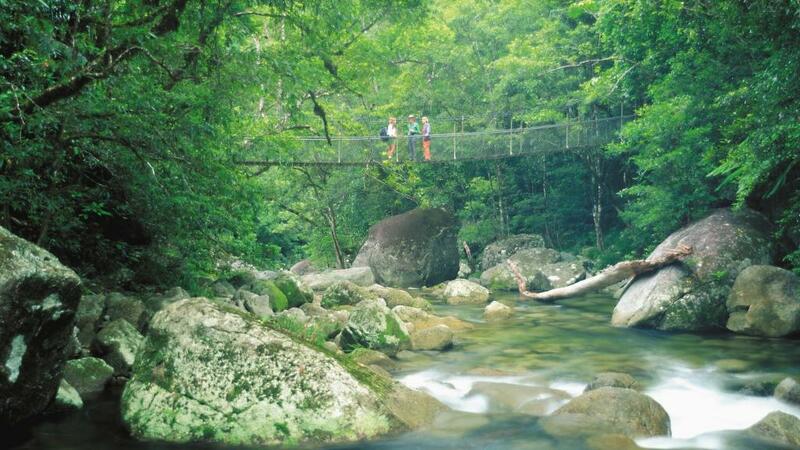 For example, head just a few kilometres west and descend into Mossman Gorge and you’ll soon see why it gets its nickname the ‘wet tropics’ – but be sure to take an umbrella. Take one of the many Port Douglas tours on offer and your guide will explain that in these parts annual rainfall is measured in metres, not centimetres. Which makes sense given that it’s one of the wettest places on earth. Port Douglas has long been promoted as one of few places in the world where two World Heritage listed phenomena come together, in this case the Great Barrier Reef and the Daintree Rainforest. However, it’s not until a passionate tour guide explains it to you right then and there as you’re experiencing it that you truly appreciate just how connected and interdependent the two are. It’s a light bulb moment, when you genuinely grasp just how special it is and why locals and visitors treat it with an almost religious reverence. Perhaps the only way to get wetter in Port Douglas is to speed the 60kms to the outer reef on a motor cruiser for a day spent snorkelling and diving the lesser known gems of Agincourt and St Crispins Reefs. Tour guides in these parts have it pretty good. It’s hard to believe that you can get paid to have fun, showing happy groups of people around some of nature’s most spectacular offerings. Truth be told, the helpful guides don’t really consider it ‘work’ either when they get to spend their days in the crystal clear water surrounded by colourful marine life. Still, if you’re not one for donning a scuba suit and descending to the depths, just a lazy day spent kicking back on the boat, knocking the top off a few frostys and marvelling at one of the world’s greatest wonders is certainly reward enough.